Introducing the latest evolution in small wind turbines. 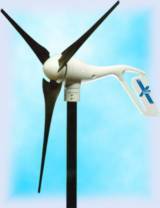 The AIR-X builds upon what has made AIR the world's #1 selling small wind turbine with new technology previously found only in today's state-of-the-art mega-watt-class wind turbines. Much Lower Noise: Previous AIR wind modules relied on their aero-elastic blade design for protection in high winds. This caused a loud flutter noise in winds above 35 mph (16 m/s). AIR-X�s circuit monitors the wind speed and electronically slows the blades as it reaches its rated output preventing it from going into flutter. This results in a much quieter wind turbine. In high winds, the AIR-X will continue to produce power at a reduced level until the wind decreases, at which point maximum potential output will resume. 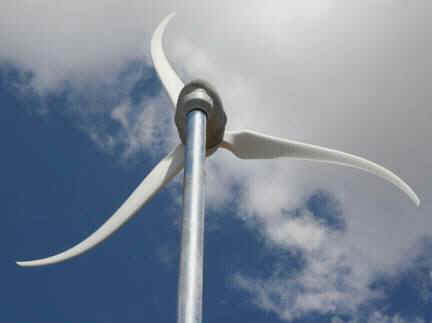 The Benefit: Quieter and neighbor friendly wind turbine. Improved battery charging: Previous AIR designs required 300-400 amp hour battery banks so the trickle charge of the wind turbine could be adequately absorbed. The AIR-X�s charge controller periodically stops charging, reads the battery voltage, compares it to the voltage setting and if the battery is charged, it completely shuts off all current going to the battery. This function is performed within a few milliseconds. The closer the battery is to reaching its full state of charge, the more often the AIR-X�s circuit repeats this action. This means any size battery bank from 25 to 25,000 amp hours or higher can be charged safely. When the battery has reached its charged state, the AIR-X will slow to an almost complete stop. Only when the battery has dropped below its voltage set point will it startup and resume charging. The Benefit: Extended battery life, no overcharging. Lower stress design: AIR-X limits power on the input side of the electronics by controlling the torque from the blades. The power no longer has to be dissipated by the electronics resulting in lower stress on the circuit, bearings and other materials. Furthermore, stress on wind turbines occurs primarily in high winds. Under these conditions, the electronic stall design reduces the blade speed to 600 rpm, thereby significantly reducing turbine and tower loading while still producing power. What's New in the AIR-X? Lower torque bearings allow for improved startup. Improved powdercoating protection, as the body is acid etched and treated with alodine before powdercoating with a UV resistant marine paint. All hardware is a marine grade stainless steel. Assembly includes "Tef-gel" compound to resist corrosive activity between dissimilar metals like stainless steel and aluminum. Body and electronics are completely sealed for prevention of water ingress, even under brief immersion conditions. There�s a great big electricity source up in the sky. Wind. It�s free, non-polluting, and endless. But until now only a few could tap into it. Now You Have the Power to Choose. Developed in collaboration with the U.S. Department of Energy�s National Renewable Energy Laboratory, Skystream was designed to be a quiet, convenient, affordable way to protect homeowners from rising electricity costs. With no batteries, Skystream connects directly to the home. When the wind is blowing, the home is powered (in part) by Skystream; when it�s not, the home is seamlessly powered by the utility as usual. During periods of strong winds, Skystream can actually produce excess electricity. Depending on the utility, the home�s meter spins backwards�giving the homeowner credit for a later date, if net metering is allowed. Skystream produces energy at less than half the cost of any other renewable energy technology. A new generation Residential Power Appliance that hooks up to your home to help you reduce or eliminate your monthly electricity costs. 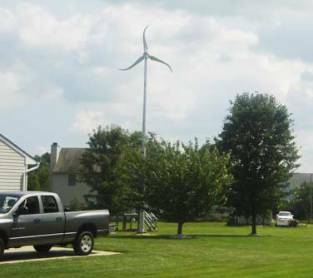 It�s the first compact, user-friendly, all-inclusive wind generator (with controls and inverter built in) designed to provide quiet, clean electricity in very low winds. A wind power engineering breakthrough, Skystream 3.7� is the first residential wind turbine to produce energy at a cost ($.09/kWh) that is lower than the retail rate of many electric utilities. Depending on the tower and installation costs, wind speed average, rebates and local electricity costs, Skystream 3.7 can pay for itself in as quickly as 4 years. A simple, all-in-one solution to harnessing wind energy on a residential scale. 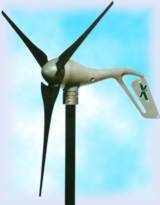 Different from all other technologies, the first all-inclusive wind generator with the controls and inverter built in. Rather than converting an inverter designed for grid-connected solar, the inverter was designed specifically for this application. Operates exceptionally quietly. In fact, the Skystream sound is unrecognizable over trees blowing in the wind. With a rated capacity of 1.8 kW, Skystream can provide anywhere from 40%-100%* of a household or small business�s total energy needs. Its sleek, distinctive swept-wing blades and elegant form make Skystream an addition to any home. Attractive with a guyless tower, Skystream blends in like a neighborhood street lamp. And because it operates at a low RPM, Skystream is as quiet as the trees blowing in the wind. 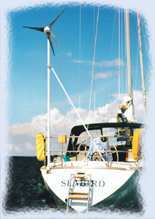 *Actual savings is based on windspeed at the site and monthly energy consumption. An optional two-way remote display unit lets you control your Skystream from up to 1000ft You can also monitor performance and download energy performance data to your personal computer (via USB converter). Advanced blade and vibration technology assures your Skystream always produces energy efficiently and quietly. Redundant safety features protect Skystream from high winds without the need for mechanical overrides. Will Skystream Work For You? Skystream is available on towers ranging from 35� (10.67m) to 110� (33.5m).2 Its universal inverter will deliver power compatible with any utility grid from 110-240 VAC.3 Skystream will efficiently and quietly provide up to 100% of the energy needs for a home or small business. Any extra energy is fed into the grid spinning the meter backward. The all-new Air Breeze Quieter, more efficient, and precision engineered to deliver more energy at lower wind speeds than any other wind generator in its class. The Air Breeze is the latest generation of Air. Small wind electric systems can deliver serious energy. This is just one lesson people are learning all around the world. From remote homes and cabins to rural communications towers and monitoring stations, people are using small wind system to generate inexpensive energy, right where it's needed. And for a great many of these people, the system of choice is Southwest Windpower's Air generator. Today, Air Breeze, the new generation of the world's best-selling small wind generator, powers countless lights, radios, computers, tools and appliances. It is also used widely to complement solar PV systems. Air Breeze is a perfect choice for hybrid wind/solar systems that provide you with the most reliable year-round energy supply. Wind energy is clean energy This isn't just any energy. Air Breeze produces non-polluting electricity. No fossil fuels are mined or burned to make this electricity. No carbon dioxide is released into the atmosphere. With Air Breeze and the power of the wind, you can forget about carbon footprints. Improved performance. Optimized energy output. Improved battery charging. Reduced sound. Increased reliability and durability. Reduced sound. More efficient energy delivery with no maintenance. Increased reliability. Reduced need for maintenance. To Order: Just Hit the [Back] Button and Email or Call Us with your Request.